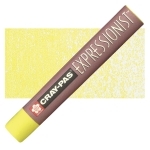 Cray-Pas Expressionist Oil Pastels are formulated with extra-fine quality pigments, waxes, and oils. They are perfect for very smooth drawing and a wide range of effects, from bold, intense strokes to subtle shading. ® Sakura is a registered trademark.® Cray-Pas is a registered trademark. ™ Expressionist is a trademark.